These two are the latest additions to Phoebe’s wardrobe. I used one of P’s other jumpers as the pattern for this cord top and the gathered plaid one is from a pattern in one of my Japanese sewing books that I resized. I love them! Phoebe sewing is addictive. Those ball-point needles will make you sew through the knits like butter….you’ll be so happy. At least, that’s my prediction, and my new year’s wish for you. My poor daughter is wearing store-bought clothes. Must. sew. more. I love the reversible jumpers… Is that a pattern you’re planning to share some day?? It looks pretty straightforward and baby sewing is always so fun!! what a sweet little jumper! Those are darling! I agree, sewing clothes for girls is so much fun. You matched the checks on the pocket!! Marvelous! I love them all! Love the red! You are so good! Phoebe is probably like dressing a doll for you! These also remind me of French children’s clothing– I’ve been perusing a lot of French blogs lately because the children make adorable drawing subjects! You would like the clothes I’ve seen. So cute! Its like sewing clothes for a doll only better! So I was sewing knits last night gearing up for a knit toddler t-shirt and my machine (with the ball points) was hating it. But my machine hates everything. Luckily I have a serger on loan that sewed knit like nobody’s business. But my real question is: did you use a pattern for the knit t-shirt shown with the brown dress or just wing it? That knit shirt you linked to is super cute. I wondered if you made it because it had that Japanese craft-book look (as in, “dang, I need that right away!” cute). Those little tops are so cute! So cute! I’m hoping to do some things for Lucie soon. Must. Take. Up. Sewing. For. Baby. Sometimes I’m jealous of moms-of-girls. It seems so much easier to find cute girly stuff somehow. A walking foot will help with sewing knits as well. sarah, no, it’s not my design. amy & cynthia, yes, but boys have better toys! what a super cute blog! i love this! Hillary, you have such an eye for things! I think you need to join team Martha! These are so gorgerous. Phoebe is one lucky baby – I bet she always looks so chic! Hilary, those are do cute. I love the little jumper! How adorable–I love all the little clothes for Phoebe. 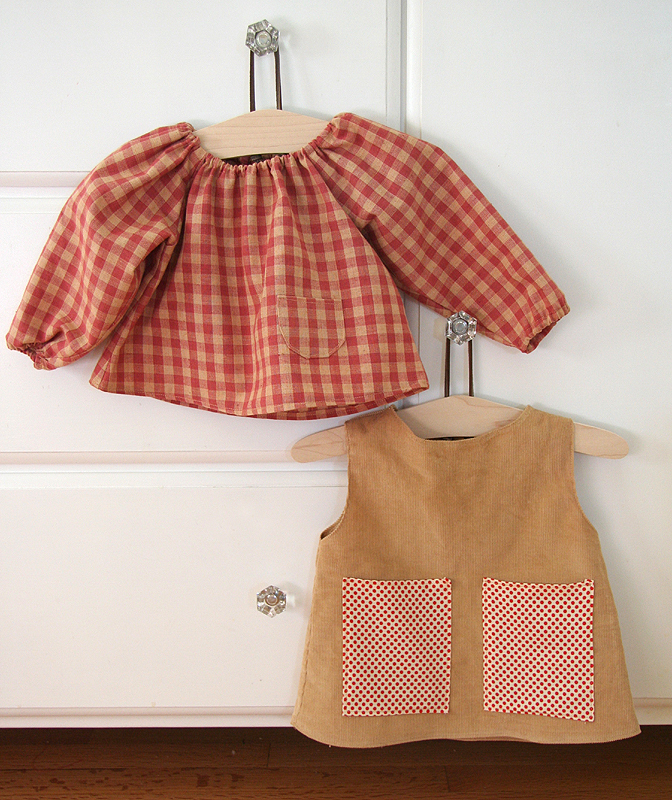 It was such a pleasure to sew clothes for my babies, too, and I really miss those days. It’s wonderful that you are enjoying this special time and opportunity with your children. I really want to try this japanese smock dress! And baby (gender tbd) kicking to get out as I write! Could you pretty-please sell your pattern as a download? would love to try this for my girls ages 5,8,10. is there a pattern you suggest. i am afaid of zippers so this elastic necked top appeals to me.